<a href="https://www.ilovedmypet.com">ILovedMyPet.com</a> - Preserve the memory of your pet with a free online pet memorial that you design yourself. Friends and family can add their own photos, comments and parting sentiments. All profits donated to The Humane Society. Here are some web sites that you may find useful. If you know of any other web sites that should be added to this list, please let us know. LegalWills.ca - Canadian Residents: Write your Last Will and Testament from the comfort of your home. No lawyer required. Just answer the simple questions to create your Will online. Make updates at any time free of charge. Lawyer approved online service. USLegalWills.com - U.S. Residents: Write your Last Will and Testament from the comfort of your home. No lawyer required. Just answer the simple questions to create your Will online. Make updates at any time free of charge. Lawyer approved, at one-tenth the cost. LegalWills.co.uk - UK Residents: Write your Last Will and Testament from the comfort of your home. No lawyer required. Just answer the simple questions to create your Will online. Make updates at any time free of charge. Lawyer approved, at one-tenth the cost. ExpatLegalWills.com - Do you own assets in Canada, the US or UK, but live in a different country? Or are you new to Canada, the US or UK and already have a Will for your home country? Write your Expatriate Last Will and Testament from the comfort of your home. Lawyer approved, at one-tenth the cost. PartingWishes.com - Write a will, power of attorney, living will or online memorial. Perfect Memorials - Explore our pet memorials with special ways to honor our friends with pet urns, pet cremation jewelry, stone memorials and more. In The Light Urns - Unique & Custom Cremation Urns & Keepsakes for a family member or pet. Whisper in the Heart - A beautiful selection of memorial jewelry and urn pendants. CremationResource.org - Information about cremating your pet. Grief Healing - Hosted by Marty Tousley, a bereavement counselor specializing in pet loss, this Web site offers information, comfort and support to anyone mourning the loss of a loved one. HelpGuide.org - A non-commercial, consumer-friendly website, providing expert information on mental health and aging, including help with grieving and loss of a pet. Pet Loss Support Page - Tips on coping with the loss of a pet, and pet loss resources. DoggoneCrazy.ca - A family fun action game that teaches children of all ages how to avoid being bitten by dogs. Highly recommended. Endorsed by the Canadian Federation of Humane Societies. Mesothelioma Applied Research Foundation - Nonprofit organization dedicated to the research and eradication of mesothelioma. PetsitUSA.com - Online directory of pet sitters, dog walkers, and dog daycares. Dog Tags Direct: Pet Tags - Military style PET TAG that is durable and wear resistant. Pet Tags - $3.49 Pet Tags....Identify and protect your best friends. The Painted Pet : Custom Pet Portraits - Artist Kayle Lamar paints stunning, life-like, dog, cat and horse portraits from your photograph. Makes a great gift for the animal lover in your life. The lessons in this 20 lesson course are designed both to help you understand and cope with the grief of losing your pet, and to guide you towards meaningful growth, healing and inspiration. Come to a better understanding of the emotional upheaval caused by the shock, disbelief, anger, guilt and sorrow that are commonly experienced when a beloved pet is lost. Each lesson is delivered to your email inbox on the start date and at the frequency of your choosing. Lessons contain suggested resources such as, online articles, web tools, discussion forum, books and meaningful ways to memorialize your faithful friend. Click here to Learn more now! The lessons in this 24 lesson course are designed both to help you and your family understand and cope with the grief of losing a beloved family member–your pet. 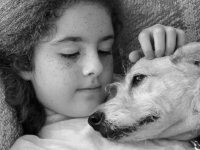 Lessons explain how children of different ages may react to the loss of a beloved family pet, and how they differ from adults in expressing grief. Find useful suggestions to help you talk with children about the sensitive topics of death and euthanasia. Each lesson is delivered to your email inbox on the start date and at the frequency of your choosing. Lessons contain suggested resources such as, online articles, web tools, discussion forum, books and meaningful ways to memorialize your faithful friend. Learn more now!